The Aspen mini lime silent + condensate pump replacement pump pack offers a straight OEM replacement pump for installs with the mini lime pump with trunking. This is the latest silent + model part number FP3322. The pack itself contains the Aspen mini lime condensate pump and all necessary items to install the replacement pump quickly and easily. 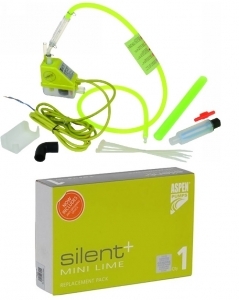 For more details on the Aspen mini lime silent + condensate pump please see the brochure below.